Foursquare , the location-based mobile service launches a new self-service advertising product for independent merchants who want to advertise to the 40 million users when they happen to be in the neighborhood. It is a first at-scale global advertising product that lets small business advertise at a hyper-local level. Over 1,000 advertisers have been participating in a beta trial that been running since last summer. The aim is to get all of the 1.5 million businesses already enrolled in Foursquare’s ecosystem to start spending money there. 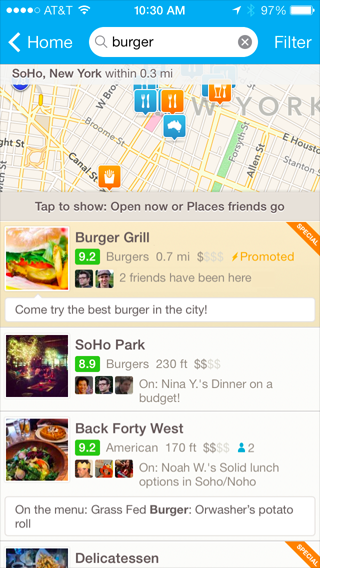 If a substantial slice of them do, it would have a huge effect on Foursquare’ revenues. On the auction-based platform, advertisers bid for a set number of user actions (eg. check-ins to a venue). An action at a coffee shop, where consumers are only likely to spend a few bucks, might cost the advertisers $1 to $3, while the same action at an upscale restaurant would probably be $5. The process is extremely simple making it easy for small businesses to target the customers. All a business owner needs to do is going to foursquare.com/ads and build their ad – by choosing a great photo of their space and either offering a special or highlighting a great customer tip. Then they set their monthly budget and push their ad live for people nearby to see. Any merchant can monitor how many people have viewed their ad, how many have tapped on it, and how many actually came into their store. Merchants know what they’re paying for – real actions and real customers. Posted in Ads, Social Media, SoLoMo. Tagged Ads, Location-based.